I liked that early check in was sort of available. Check in was super easy and so was check out. They seemed to be very accommodating. The property is well maintained. The rooms are well appointed. The staff was helpful. The included breakfast was good, with enough of the standard offerings. Our 2nd stay here. We will consider staying here again, and will recommend with some conditions. They checked me in early. They gave me a huge room since we have 2 kids. The room was newly remodeled and very clean. They brought us a brand new pack n play for our baby to sleep in. Parking was easy and close by. Staff was friendly. Room was quiet. Complimentary breakfast was good. Thanks! The staff was amazing friendly...even the construction workers that were there. The staff was most helpful. Person at the front desk went above and beyond when I arrived late at night. It is a very clean and comfortable hotel ! Has a great breakfast ! Plenty of parking. Close to stores and restaurants. Very clean. AC worked. 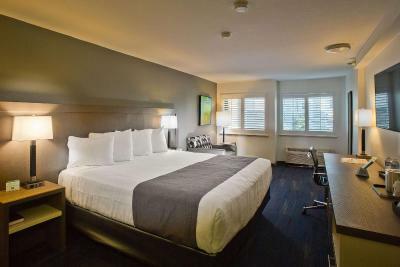 Best Western Crestview Hotel and Suites This rating is a reflection of how the property compares to the industry standard when it comes to price, facilities and services available. It's based on a self-evaluation by the property. Use this rating to help choose your stay! One of our top picks in Mountain View.Located within a European-style village, Best Western Crestview Hotel and Suites provides free WiFi and free on-site parking. Guests of this boutique hotel are offered a daily complimentary breakfast. This Mountain View hotel is just 10 minutes’ drive from Great America Theme Park and Levis stadium. The beautifully-appointed guest rooms at this hotel feature refrigerators, microwaves and a 40-inch LCD cable TV. A large walk in shower is also featured..
A 24-hour front desk is offered to guests of Best Western Crestview Hotel and Suites. Guests have access to laundry facilities. A business center is also available. This Silicon Valley hotel is only minutes from GOOGLE, SAMSUNG, Mozilla Foundation, Symantec and Intuit. When would you like to stay at Best Western Crestview Hotel and Suites? This suite has a microwave. This suite has a kitchen. House Rules Best Western Crestview Hotel and Suites takes special requests – add in the next step! One older child or adult is charged USD 12 per night in an extra bed. Best Western Crestview Hotel and Suites accepts these cards and reserves the right to temporarily hold an amount prior to arrival. Very overpriced, limited parking. Walls & ceiling paper thin, could hear people on the floor above pacing in their room late at night. Then heard their alarm going off at 5am and more pacing across the room. I would expect this at a motel but not a hotel and especially not at the price point. From my room I can frequently hear sort of "printer-like" noise at any time of day or night. Neighboring room's shower is also a bit noisy in the morning. Freezer is also a bit noisy. Nice roomy room, quiet place but very good location. Maybe silly comment, but I find pretty useful to have USB chargers in the lamps. It is good to know that some hotels are already aware that people is using mobiles phones and need charging. The hotel was under construction which would have been fine if I had more notice. The only notice posted was a piece of paper taped to the wall at the back door. I didn't really know where my room was since I was only told where the elevator was, but my biggest issue was with people putting in new carpet. I had to maneuver around them and it was a little difficult with my bags. Other than that it was super easy. Property is under renovation. As such, our room description did not match the room we were first assigned. We expected our accommodation to include a sofabed (or futon) for the 3rd adult in our king suite. Apparently, as part of the renovation, these have been replaced with 2 chairs in the front area of the suite. There are no rollaway beds at the facility. As such, the king suite CANNOT accommodate up to 5 adults, as stated. It can barely fit 3, all sleeping in the one bed. We moved to a downgrade (standard 2 queen bed room, lesser price). Location is convenient for business trips. The bed was quite comfy. Construction work going on and it's very noisy in the morning, drilling and all sorts of noise right outside my room! Constant repairs just outside my room door. Was waking up with loud sounds of drilling and hammering. Lobby entrance has beautiful decor. Great customer service at check in. The hallways smelled fresh and the carpets was clean. The decor is beautiful in my room, The papaya lotion, body wash, and hand soap smelled wonderful. The decision to add it as a dispense on the walls is a great idea. Good size room for for a couple with plenty of space, clean refrigerator and room, nice furniture and big Samsung tv, quite place and great location. Not a big deal, but I would have liked a tub for the kids (baby kept slipping and falling in shower) and a hot tub on premesis (website listed a hot tub).